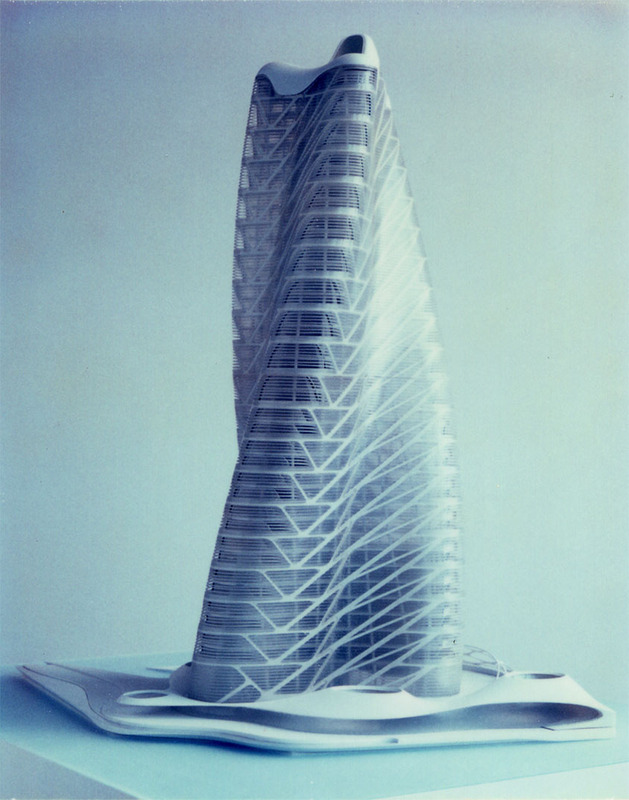 Looking through an old hard drive, I came across these great Polaroid photos of a 3D printed model of the Strata Tower that we made while I was at Asymptote Architecture. We recently presented these preliminary concept images of a floating restaurant, bar, and event space called Super Barge. While the renderings look somewhat developed, they are really just quick sketches to get an idea across. After a positive reception at our initial meetings, we spent a good bit of time researching the logistics and budget of fully developing the project. We're heading into a new round of development now, and looking forward to radically improving the design, particularly given the interesting possibilities we discovered while doing our homework. 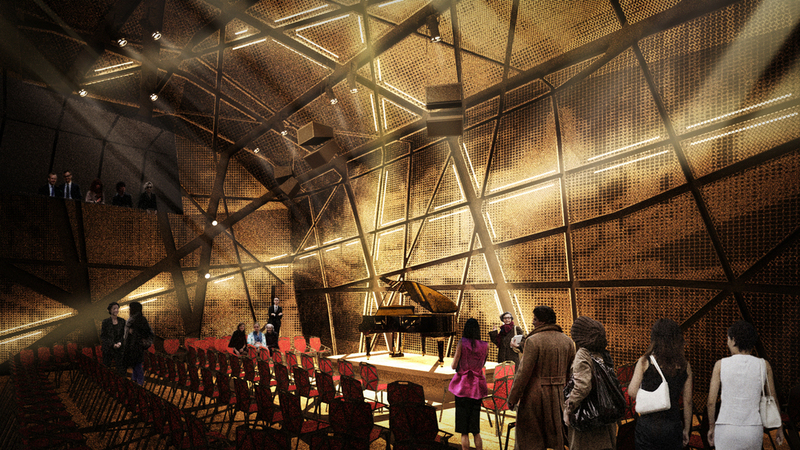 I love this light filled, night render of our design for Original Music Workshop. Here's a sneak peek at a new project we're developing (can't say any more than that for the time being). Here's a detail view of the panel system we've designed for Kinesthesia Physio in NYC. This cut-away rendering shows the overall design concept for Kinesthesia Physio, our new project at The Whitman in NYC. 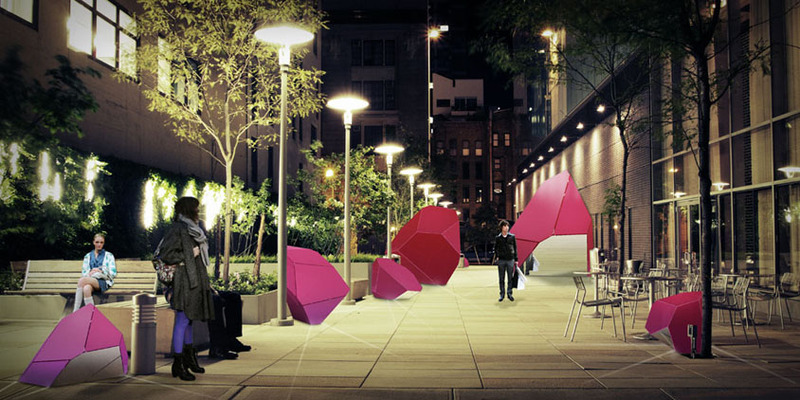 Color Block is our recent proposal for an invited competition to add some life to downtown New York's Hudson Square. After more than two years of work we have finally begun construction on our biggest project to date, the 15 million dollar Original Music Workshop (OMW) in Williamsburg, Brooklyn. Final floor plan for Original Music Workshop. After a year of research, planning, design, and revisions, we've finalized our design for Montello, an artists retreat in the northeast Nevada desert. See a project overview here. This unfolded drawing shows the complete interior surface of the performance hall we are designing. The black lines will be steel channels that house all infrastructure and the surface panels will be acoustically transparent, perforated aluminum. I think I prefer it with graffiti. We recently finished the schematic design for another Ecco Eco project in LA. 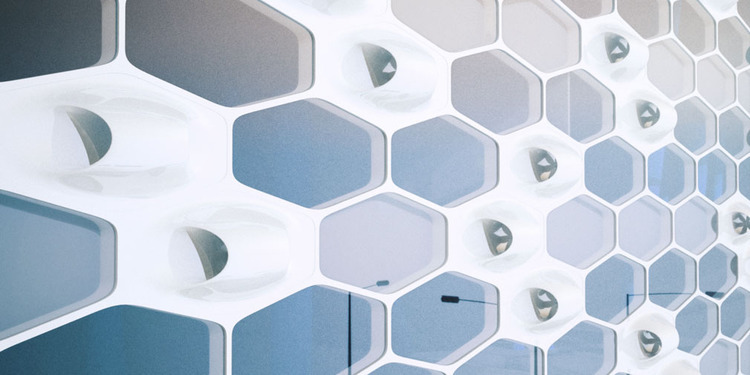 Like Ecco Eco NY, the building is intended to produce brand identity through the production of architecture that is sustainable, memorable, and proactive. 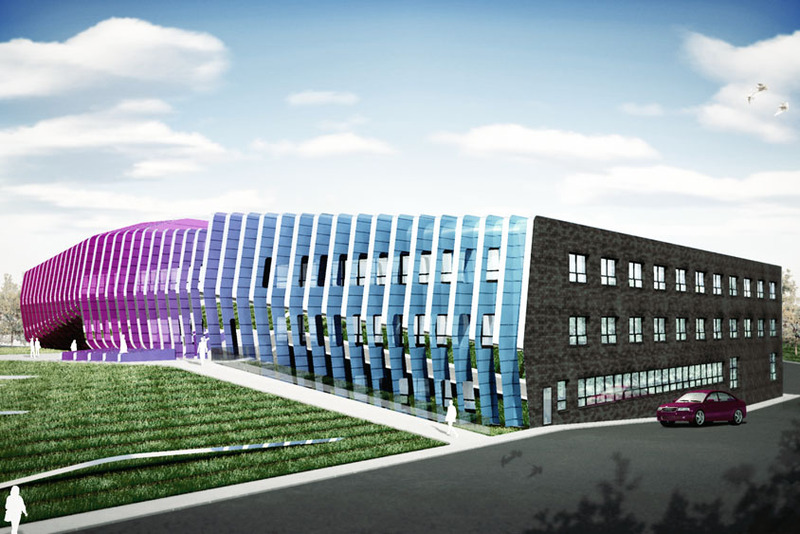 Integrating sustainable design elements into an ornamental patterned volume, the signature element of the building is a facade comprised of custom wind turbines that harness energy from passing winds as well as from wind produced by the building’s air displacement. Here’s a quick peek at a wind turbine facade system we’re developing at Bureau V.
Here's a detail of our facade proposal for Ecco Eco. Ecco Eco New York is a redesign and renovation of an existing structure to house the offices of Ecco Eco, an environmental design initiative. Currently in the research and design phase, the building is intended to take advantage of sustainable energy sources while providing an iconic presence to the environmental brand. 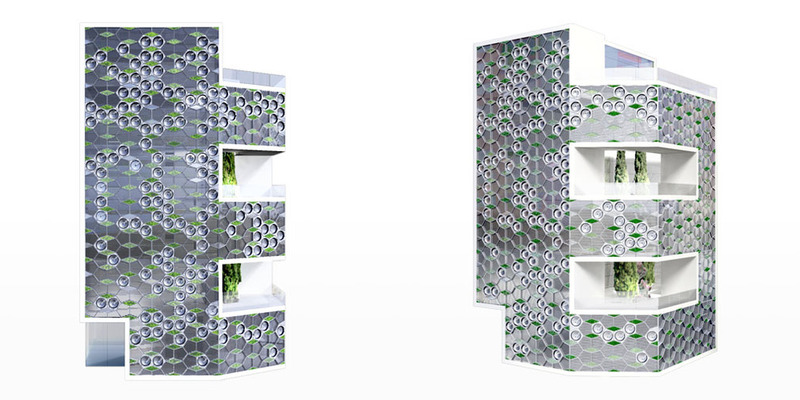 Combining environmental performance with graphic design, the signature element of the project is an intricate patterned facade comprised of custom parabolic solar panels and landscape elements that produce electricity and improve the urban air quality. I'm working on the design of a green facade comprised of landscape elements and parabolic solar panels that self orient towards the sun. Bureau V has just completed the design of our first project, a renovation of a commercial office space on Sylvan Avenue (aka Trillion Dollar Mile ) in Fort Lee, NJ. The project includes a complete redesign of the building facade and a gut renovation of the interior.